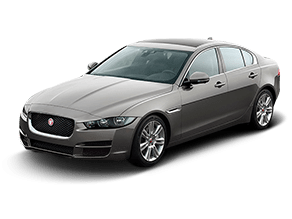 The new Jaguar XE in Ventura, CA has all of the tools needed to make the traditional powers in the high-performance compact luxury sedan class on notice. Drivers aggressively attacking the twists, turns and curves of a road will enjoy the specially-designed superstructure of the new Jaguar XE and its lightweight aluminum architecture. The materials used to build the body of the Jaguar XE help provide a nearly perfect 50/50 weight balance while preventing the body from twisting as much as possible. To further enhance handling and stability, the new Jaguar XE uses automatic torque vectoring when a driver applies the brakes heading to a curve to prevent the loss of traction. Jaguar Ventura customers will have six trim grades to choose from XE base, Premium, Prestige, R-Sport, S and Portfolio. The most glaring differences among the trims of the new Jaguar XE in Ventura, CA is the level of performance available. Base models are outfitted with either a 247-horsepower gasoline engine or a diesel engine making 180 horsepower. A supercharged, V-6 engine making 340 or 380 horsepower can be placed under the hood of the remaining trim grades. Additionally, some of the top trims of the new Jaguar XE offer configurable dynamics technology. This system allows drivers to customize the transmission’s shift points, throttle response and the car’s handling profile. Drivers behind the wheel of the new Jaguar XE in Ventura, CA are getting a vehicle that does more than pay lips service to performance driving. The dashboard and other controls of the Jaguar XE are precisely placed to make them as intuitive for the drive to use as possible. In fact, the interior of the car is built to provide the feeling the driver is wrapped inside of it. Potential owners of the new Jaguar XE in Ventura, CA will have almost complete control over how the interior of their car looks. The upholstery material and many of the accent pieces of the Jaguar XE can be chosen during the ordering process with a Jaguar Ventura sales professional. Passengers in every available seat will be able to find a comfortable seating position thanks to the vehicle’s generous interior dimensions. 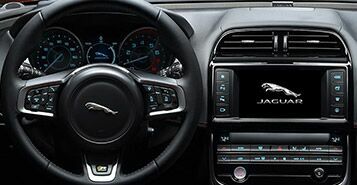 Just about every system that can be found inside of the new Jaguar XE in Ventura, CA can be controlled by the InControl Touch multimedia infotainment system. 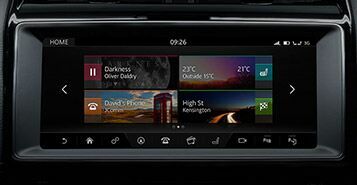 The eight-inch touchscreen uses familiar touch and swiping motions for full control over the audio system and GPS navigation. Additionally, the center gauge cluster consists of a 12-inch interactive driver display which can be customized to four different preset displays.